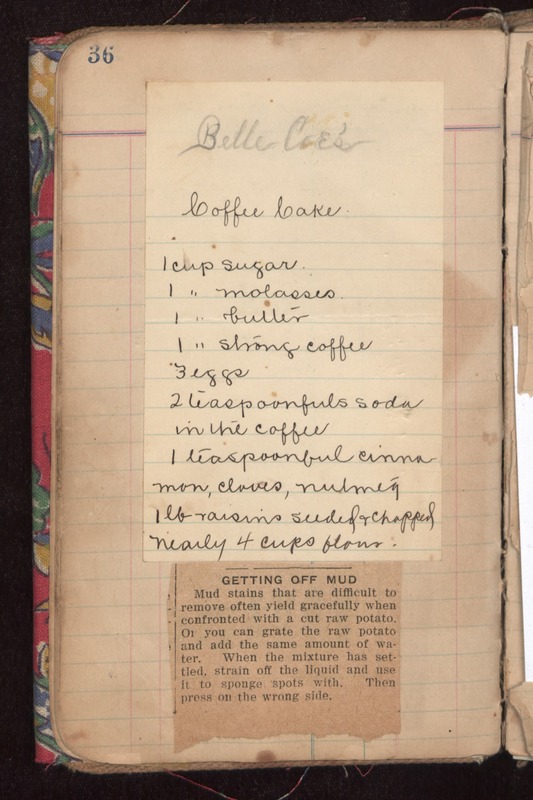 Belle Coe's Coffee Cake 1 cup sugar 1 " molasses 1 " butter 1 " strong coffee 3 eggs 2 teaspoonful cinnamon, cloves, nutmeg 1 lb raisins seeded and chopped nearly 4 cups flour. GETTING OFF MUD Mud stains that are difficult to remove often yield gracefully when confronted with a cut raw potato. Or you can grate the raw potato and add the same amount of water. When the mixture has settled, strain off the liquid and use it to sponge spots with. Then press on the wrong side.